Demirkol, I.; Paradells, J.; Oller, J.; Casademont, J.; Calveras, A.; Catalan, M.
Wireless sensor networks have paved the way to a new era in user applications, where information can be sensed, processed, and distributed from remote environments with minimal or no human interaction. As the sensor nodes in these networks are often battery-operated and communicate wirelessly, they are constrained by limited resources such as bandwidth, processing speed and especially by energy. Therefore, depending on the user application, different challenges are encountered for the realization of wireless sensor networks. 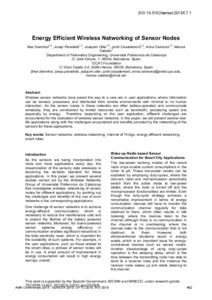 In this paper, we will present several reallife applications along with the challenges encountered and benefits provided by the networking of the sensors for these applications. Demirkol, I. [et al.]. Energy efficient wireless networking of sensor nodes. A: International Conference on Sensors and Measurement Technology. "AMA conferences 2013 proceedings: Nürnberg Exhibition Centre, Germany, 14-16. 5. 2013: with SENSOR, OPTO, IRS²". Darmstadt: 2013, p. 452-456.